Finding the best hotel of your choice can be easy when you recognise popular brands like Intercontinental Hotel, Rixos Hotel or Hyatt Regency. But how to find a hotel in Kazakhstan with only a handful of such hotels with international recognition, and moreover if they all are luxury hotels. That's when internet comes handy. We search for any information we can find online to get some idea of what to expect when we arrive in Kazakhstan or anywhere else in the world. So to make that search easier for you I put together some hotel information that hopefully helps you to find the best accomodation to stay during your visit to Kazakhstan. As Almaty is the most popular destination in Kazakhstan among travelers and businessmen, I logically concentrated my initial attention on gathering soem info about Almaty hotels. Now are you ready? Here we go. 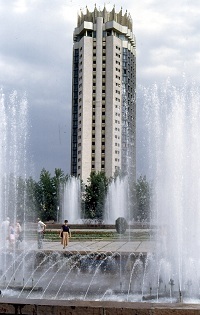 This 25 storey building is the highest built on the territory of the former USSR in earthquake region. It was built in 1978. It is over 100 meters (330 feett) tall. For its unique architectural style it has been depicted on stamps, picture, painting, post cards and maps. Years ago quite often you would see bedside lamps shaped like this hotel for sale or in people's houses. 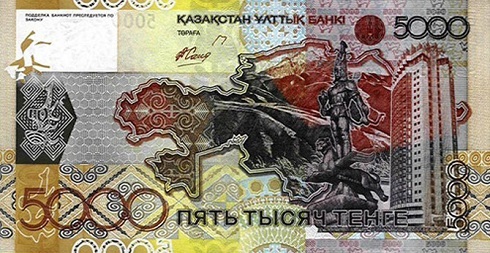 And now the outlined image of this Kazakhstan Hotel in Almaty is on the latest Kazakhstani banknote of 5 000 Tenge. Some tourists like the hotel for the experience of living in a Soviet building. But that's not the only reason why many people like the hotel. Its location in the city centre on Dostyk Avenue attracts many visitors to stay there. Many tourist attractions in Almaty are within walking distance from the hotel. You can enjoy a great panoramic view over the city and to the mountains from over 100 meters (330 feet) above ground, when you are up on the top 25th floor of the hotel. If you want to get away from the city in a hot day, it is two minutes walk to the cable car to take you to Kok tobe. You can also take a bus just opposite the hotel and within about 20 minutes you'll be in Medeo (1691 meters or 5550 feet) or you can even go up to Chimbulak (2300 meters or 7546 feet) or you can go to the Panfilov park. The hotel used to be under the state ownership, and only in 2006 it passed into private ownership. So fingers crossed we expect some radical changes in near future. By the way there is a hotel in Almaty that's called the Almaty hotel. Return from the Hotel Kazakhstan to Guide to Kazakhstan home page.